I love cooking meals from scratch. But sometimes reality hits and I have to throw something together that doesn’t require a lot of preparation. That’s where this quick fix copycat of McDonald’s chicken sandwich comes in. In less than 30 minutes I get to enjoy a rather tasty chicken sandwich. Heck it even has fresh toppings on it and a rather tasty (but incredibly simple) sauce. Hey, it’s not bad when you’re in a crunch, and I often find myself making little changes to mix things up a bit. Add a little kick to your quick fix copycat McDonald’s chicken sandwich by substituting Tyson’s spicy chicken patties, adding a slice of pepper jack cheese, and adding Sriracha instead of onion powder when making the sauce. Also try my copycat of McDonald’s addicting French fries. Heat the chicken per package instructions. Meanwhile, make the sauce by whisking together the ingredients. Toast the buns if desired. Slather both bun halves with the sauce. Add the heated chicken patties, lettuce and tomato (and onion if using) and serve. I used to work just down the street from a Quizno’s. I went there often for lunch. Ok, very often. I loved their toasted bread and great meats and toppings. 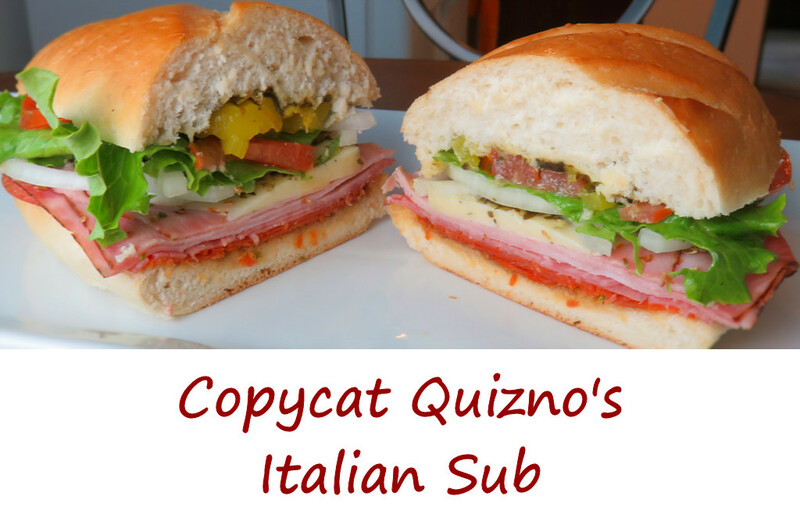 Now I work from home and I prefer to make my own lunch, so I make a copycat of the classic Quizno’s Italian sub, my favorite item on their menu. The sweet balsamic dressing and pesto are what really make this sandwich memorable. Even if you don’t follow the recipe for the toppings exactly, make the dressing and add the pesto. I find pepperoncini peppers to be a must-have on a sub. And on a pizza for that matter. I prefer them over pickles. They’re crunchier and tangier and really wake up whatever you put them on. Also check out my copycat of the Battalion Chief Sub from Firehouse Subs and Subway’s Italian BMT. Split rolls horizontally and place onto baking sheet(s). Brush one cut side of the bread with the dressing. Spread about 1 tablespoon of the pesto onto the other side of the cut bread. Add meats and cheese and sprinkle lightly with the oregano. Add remaining ingredients and serve. I could make (and eat) ‘fried’ chicken using my Vortex BBQ all day long. It has never let me down. It has never been anything but easy. This copycat of Church’s fried chicken was no exception. Incredibly crunchy skin. Unbelievably moist and flavorful meat. And as easy as coating it, grilling it, eating it. Done. There are no tricks or special handshakes that you need to know to get fried chicken right using the Vortex. And although a lot of sites say to rotate the lid every 15 minutes while cooking, I’ve not found that it makes a difference. I don’t over-crowd my grill and I make sure I have a super-hot fire. If you’ve found that rotating the lid is a requirement, let me know but so far, I’ve not had anything but success just keeping the lid right where it is. I also do not flip my chicken while it is cooking. Doing so will result in ‘batter loss’, a bad thing. Just keep it right where it is. Also try my insanely-awesome proper pub fried chicken, another fantastic recipe for deliciously crispy tasty chicken cooked using the Vortex. You can also use off-the-shelf fried chicken coating to make spectacular chicken on the Vortex. Check out my Kentucky Kernel chicken too! Fire up your grill with the Vortex BBQ. Let the coals get good and hot. Combine all of the dry mixture ingredients in a pie plate. In another pie plate, whisk together the eggs and water. Working in batches, dip the chicken into the wet mixture, then into the dry mixture. One more time, dip the chicken into the wet mixture and then the dry mixture. Transfer chicken to your grill grate around the Vortex and cook until done, about 45 minutes. Lightly brush the chicken with oil the last 5 minutes of cooking to get a crispier skin.